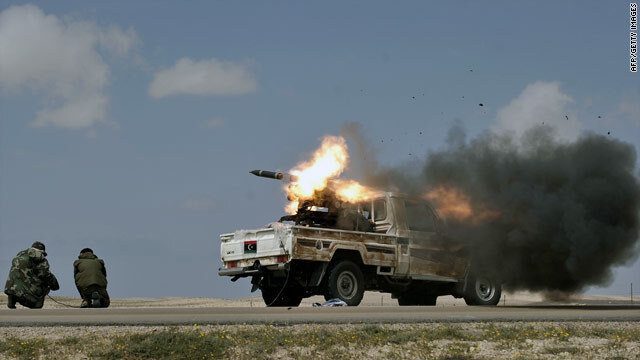 Libyan rebels fire rockets against forces loyal to Moammar Gadhafi at an area some 20 kms from Brega on March 31, 2011. Does the U.S. really want to own Libya? American statesmen have always experimented with the use of limited military means to support foreign policy interests that are important, and worth engaging American power, but not vital. From the Barbary wars (fought against the Barbary States, which included parts of modern Libya) to gunboat diplomacy in Asia to the many military interventions over the past few decades (Grenada, Lebanon, Somalia, the no-fly zone over Iraq, Bosnia, Kosovo), the United States has often tried to find ways to use its military yet not engage in all-out war. Some were more successful than others, but in all cases, the central task was to find the balance between the goals we sought and the means we were willing to deploy. The time we didn’t ask questions about the costs and simply escalated the means, we ended up in Vietnam. The tendency for a president is to be pushed to achieve a decisive victory, no matter the costs, no matter whether the interests at stake are vital or secondary. Presidents want to be leaders of great causes, and the Libyan mission is certainly a good cause. But the more grandiose the rhetoric and the goals, the broader the military mission. And then the United States takes responsibility for the fate of Libya — a country riven with tribes, lacking strong institutions and a civil society, and destroyed by four decades of Gaddafi’s madness. Do we really want to own this, and largely alone? Is it such a bad idea that others should be involved? As I argue in the op-ed, limited interventions might have limited successes, but they can also avoid catastrophic failures. President Obama's reasons for employing U.S. military force in Libya are idealistic at best, if not hopelessly romantic at worst. Unfortunately, idealism is not what drives, much less influences significantly, the clashes and movements in relations between and among nation states. Foreign policy veterans, and most military leaders know that intuitively, if not explicitly. Woodrow Wilson’s League of Nations idea following The Great War is a good example of what happens when the ideal conflicts with the real. As Americans, we harbor very idealistic notions about wars of rebellion. It is part of our own History, mythology, and legends. History is grittier than what we wish, and harder than what we would like to remember. All civil wars and rebellions are ugly. Something President Obama and the rest of us will learn in due course in Libya. Arabian Spring ? or Global Awakening? President Obama is obviously a man of conscious and the fact that he has refused to sit on his hands in the face of the happenings across Northern Africa and surly now events building in the Middle East demands that the U.S. needs to forge new policy. The U.S still being a super power with responsibilities that come with the title, is obligated to lead not only in forming needed new international policies for America but also by example set the bar for all nations of the world to follow. Because of our fundamental democratic believes, believes in freedoms, the rule of law, equality, and most importantly truth; our policy makers now find themselves in a vary difficult position. These countries around the globe with their populous demanding change and hopefully desiring to move towards a system similar to our own; are now forcing us to evaluate our own policies in dealing with dictators that all the nations of the world have had relationships with for decades. Its time for the U.S. to begin the process of coming clean or the face the consequences; that we can no longer continue this business as usual practices with murderous dictators. If America and the nations of the civilized world continue trade relations with such dictators we not only promoting but also empower the vary behavior that we deplore. The closest thing we have to a globe committee is the United Nations and honestly we all known the dysfunctional qualities of committee rule. Getting things done under such constraints are merely impossible, thus the other strong reason why America and currently the Obama administration needs to and has to take on these issues as impossible as they may seem. The U.N. mandate 1973 is surly only the beginning of a conversation that all the nations of the world need to begin. That if the nations of the world are going to come together in consistent policies that effect the populous of the world now is the time. If our policy makers don’t lead the way; we are no better than an individual who buys stolen goods, from a murder. Does the U.S. want to own Libya? Of course it does!!! Only a person whose IQ is less than 10 would believe otherwise!!! What a ridiculous question! This question seems to confirm the views of the Libyan people lately, that the U.S. is after their oil. Otherwise the Americans can't be bothered to engage themselves in this millitary foray. No, the U.S. doesn't necessarily want to own Libya, but it wants to show the world, who has more to say. Of course the U.S. wants to own Libya as anybody with half a brain would surmise. Why do you think that Obama's setting up a "no-fly" zone and now arming the "rebels" for? After all,Libya is an oil rich country like Iraq and we invaded Iraq and now own it for that very same reason. This is a three layered chess game for the removal of a dictator. If I may explain the first layer of the game is a least cost intervention meaning no blood and very modest treasure used. Second layer is the CIA they will goose things along to the conclusion and the objective we need. Third layer offer buisness and jobs for all of those 20 year olds that just want the freedom to get jobs that pay well. This is known as a piece of the action. Remember if our emotions control our moves we will loose. Everybody thought Regan was nuts two but it worked. There was no real operational star wars program. I am going with the President on this one he is precise when he wants to get something done. I feel it serves the U.S. well in keeping some portion of the globe destabilized, but in the end, this game is going on since far too long for anybody's comfort, American Middle East policies have indirectly contributed to the economic down slide of that nation. it would be in everybody's interest that America stops playing the global cop, else it might find itself pitted against the whole world in manner of the Nazis during the penultimate stages of the WW II. It grieves me to see mindless cynicism and downright non-comprehension in the comments here. The question is not whether we want to "own" Libya, but whether we want to "take ownership" as the current business jargon goes of the whole Libyan situation. I think the administration has answered that with a resounding "no". Afghanistan and Iraq show what happens when we involve ourselves in primitive countries with tribal loyalties and no history of democratic institutions. When you remove a dictator in a country of this nature, all you do is create a power vacuum. If you leave, you will just leave it to some warlord to take over again. If you stay and try to do "country building" with military means (and the military are the wrong ones to do this in any case) you just unite the people against you as the foreign occupier. No fly zone to prevent a Rwanda style massacre of innocent civilians? That's fine. Arm the rebels? Ok, but let the other Arab states do that. No, we don't want to "own" the Libya mess. That's for the Libyans to figure out.